You are here: Home / Rats / Does the Law Allow You to Kill Rats? With the exception of portions of the province of Alberta in Canada, a few islands off the coast of New Zealand, and virtually all of Antarctica and the northernmost Arctic regions, people all over the world have to deal with rats. The methods people can use to trap and kill rats, however, vary from country to country and by local jurisdictions with them. Most jurisdictions in the United States not only permit you to kill rats, they sometimes require you to. But a few locations in the USA have especially restrictive rat control laws. Since January of 2012, the District of Columbia (Washington, D.C.) requires exterminators to trap “wild” rats and release them—usually in neighboring Virginia and Maryland. The District of Columbia bans both rat snap traps and rat glue traps and encourages the relocation of “intact families” of rats to the wild with the help of a “wildlife rehabilitator” to assist the rats in adjusting to their new lives in someone else’s back yard. While the law exempts “commensal rodents” that live in houses, it covers “rice rats” that live in high grass, trees, and flower beds. The law also applies to squirrels and chipmunks. All 50 states of the USA permit rat control with dogs and cats. Employing dogs to hunt rats “for sport,” however, is illegal in most jurisdictions. A few complaints by PETA (People for the Ethical Treatment of Animals) have resulted in arrests in New York City. The US federal government permits indiscriminate use of all kinds of rat poisons, but new regulations will go into effect in 2012 requiring rat poison to be packaged in ways that make it inaccessible to pets and children. It will no longer be possible to buy rat poison to be scattered. All Americans should consider risks to children and pets of others when they use any rat control method. Unless a child is harmed or there is gross lack of consideration of consequences in the use of a rat control method there will likely be no criminal liability, but Americans generally are at risk for being sued for economic losses. In 2010, the EC proposed a ban of sale of rat poisons to homeowners, restricting their use to licensed pest exterminators. Other means of rat control, however, will remain generally available. In the UK, home owners who set out rat traps in their gardens and yards may be found financially liable for death or injury to neighbor pets if they do not take precautions to prevent access to the traps by pets. This can be as simple as placing a box over the trap that is high enough for the rat to enter but too low for cats and small dogs. Certain parts of Canada have never been colonized by rats, including Calgary in Alberta as well as most of the Yukon, Northwest Territories, and Nunavut. Provincial authorities in Alberta not only fumigate suspected infestations of rats in goods shipped across the border with Saskatchewan, they are authorized to use pistols to shoot stray rats to keep them from entering the province. 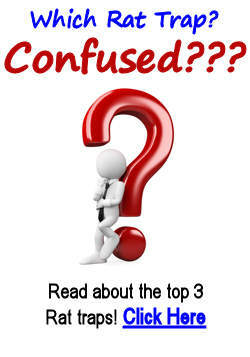 However, HealthCanada recommends different methods for home pest control by individuals. Canadians are generally advised not to try to trap mice, since most of the species of mice common in Canada are capable of finding their way back to a house—even when they have to swim rivers—even if they are released 2 km (1.2 miles away), so I guess that puts an end to controlling pests humanely. During their transit back to the house they can acquire ticks and fleas that carry diseases that can be caught be people. Rats, however, are more territorial and will not usually return to the location where they are caught. Winter weather in Canada is a significant deterrent to the return of the rat. Australia has over 60 species of rats, although only the black and brown (Norway) rats are invasive. Rats of all kinds often live in sugar cane and grain fields, emerging to find new homes nearby after harvest. Summer floods can drive rats from farms into nearby towns. 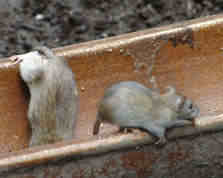 Australian regulations make a distinction between native rats and invasive rats. Native rats are part of the landscape. Only invasive rats are to be killed. The most commonly used rat poison in Australia is a chemical called zinc phosphide that is sold under the trade name Rat-Off. It is only available when a public official certifies the presence of invasive rats. Unlike the anticoagulant (blood thinning) poisons used elsewhere in the world, Rat-Off breaks down quickly and does not endanger wild life (or people) that may come in contact with the dead rats. New Zealand still permits the use of older-style anticoagulant rat poisons, although these are more likely to be put out by public officials. Both countries permit rat zapper traps, and ultrasound rat deterrents. The Royal Societies for the Prevention of Cruelty of Animals do not advise against killing or trapping rats, but encourage the use of human methods. The RSPCA suggests trap and release of rodents whenever possible, checking the trap regularly to make sure trapped rats do not succumb to dehydration or starvation before they can be relocate to the wild. Snap traps are considered humane if they are checked regularly for animals that are only injured instead of killed; injured rats should be killed with a quick blow to the head. The RSPCA advise against the use of poisons because they cause a slow death, and the poison may be consumed by pets and desirable wildlife. National Geographic, Large Island Declared Rat-Free. U.S. Environmental Protection Agency, The Federal Insecticide, Fungicide, and Rodenticide Act (FIFRA) is the Federal statute that governs the registration, distribution, sale, and use of pesticides in the United States.